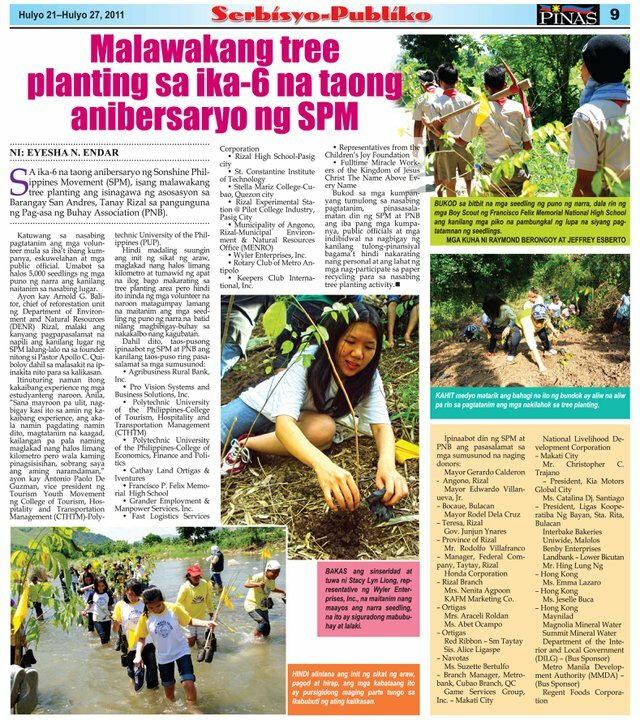 If you can recall, I invited a every one with my post "Pag-asa ng Buhay Tree Planting 2011" (see previous entry) It was an awesome experience! I invited my cousin, sister and a friend to go with us and we all enjoyed it. We arrived at the meeting point on time at 6:00 a.m. but due to some transportation difficulties, the bus arrived only at around 8:00 a.m. According to the organizers, it was because MMDA pledge to lend two buses and just the night before, they suddenly changed it to only one bus. After 4 hours, we arrived at the planting site or at least 3 kilometers near it. It was a long road trip so we all had to go for relief. To our surprise it was a long way. I had no idea where it was exactly but I think it's someone in Mt. Batolusong in San Andres Tanay. As soon as we arrived, everyone settled in it the large hut. Since we were the second out of three batches, we had to wait for the first batch to return. Although we had packed sandwiches, the organizers offered us food. It was our first time to eat rice like that. It was tasty and fragrant. We also enjoyed the "adobong manok (chicken)"
There were nearby vendors were we bought fresh coconut and hard-boiled egg. After lunch we were oriented by the DENR on how to plant and we were given our name tags that will be attached to the trees and flags. We were also asked to pick our plants. When the first batch came back, we were asked to fall in line and we began our three-kilometer trek. We were asked advised to wear pants and rubber shoes so we had no idea we had to go through a stony creek. We had to remove our shoes and pull up our pants as much as we could. Every step of it was painful. I felt my sole sore but I had to keep on going. We had to cross three creeks in total. Some of them had greater pressure so it was difficult to cross. However, local kids were swimming there. When we saw street signs, we were already near the area. When we arrived, we were surprised that it was an uphill planting site. It was our first time to go tree planting more so an uphill tree planting. We had to go up, find a spot, dig and bury. So I dug with my flag. Poking the ground until it turned into a hole, tore the plant plastic and placed my plant into the hole, burried it with my hand and stepped on the surrounding soil to make it harden. My plant stayed straight and stable. I attached my name tag on it and stuck the flag at the same location. Then, we had to leave before the third batch comes. Everyone was so tired that they stopped by a small sari-sari store hut. On the way back, we encountered the third batch. We passed by a lot of animals. Last month, we ate at Takumi. As we entered, we noticed that most customers here are Japanese. The ambiance is good. They have a dining area, sushi bar, drinks station and private rooms. You could also view their kitchen through its glass window. Hmm.. Why are their chopsticks named after another resto? Looking at their menu, it was really difficult to decide on what to order. (see partial menu below) Most of my family ordered noodles while I ordered Gyudon because I was craving for it. Gyudon is one of my favorite Japanese dishes! Their orders were Miso Ramen, Syouyu Udon, Kitsune Udon, Tempura Udon and Wakame Udon. All their noodles were delicious! Each have their different broth taste. The Miso Ramen was huge and difficult to finish. The best noodles for the night was Wakame Udon. It's a must-try! It was light, flavorful and refreshing. Their Gyudon was very chunky. It was the first time I ate Gyudon with beef cubes instead of strips. It was a heavy meal. Look at all those meat and tendons. The taste was good but certainly not the best. The meal also comes with free soup. Overall, the meal was good. You get to taste authentic Japanese flavors. Meal servings are big so price is just right. The ambiance is quiet and customers are Japanese so you get to feel their culture. If you want to try it out, I recommend the Wakame Udon! Simply the one of the best I've tried! Hope you share you're dining experience here too! The Original BonChon Chicken ~ Soy Delicious! Pain Monster Invasion at Market! Market!